An ILI report showed a number of low spots at three separate locations along a 100 feet stretch of gas pipeline. When the previous ILI was performed 7 years prior, these low spots did not exist. The operator not only wanted data to tell if the corrosion was episodic or in nature or active but also did not want to fix/repair the pipeline and did not want to perform another ILI on a shorter interval. 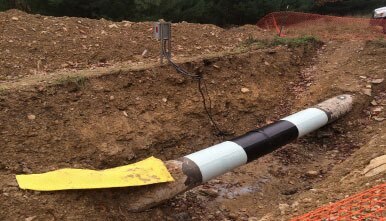 After mapping the internal corrosion on the pipeline, installed sensors were deployed to monitor the low spots along the excavated line.